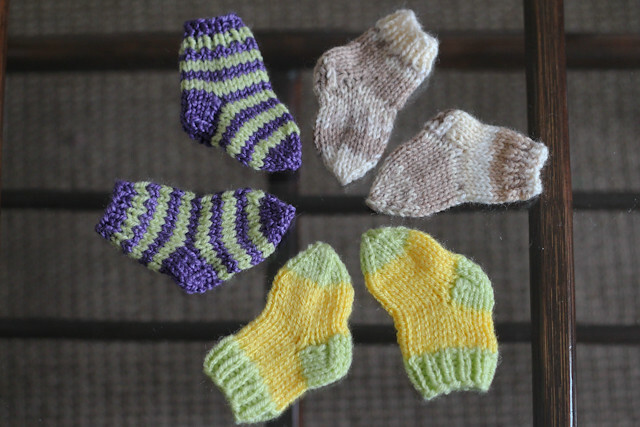 As my little nephew is freezing in Manchester (it's only +16 in their appartment, and even less during the night) I just thaught it would be right to make him some little socks. So, I'm not only making them, but sharing a free pattern with you too! First of all, we'll need some DK yarn leftowers. I really mean some scraps, because for such a tiny project you don't need much of yarn. So it's ideal for using some bits from your bigger projects. Then we'll need a set of 2.5mm double pinted needles. My gauge was: 10st x 10 rows = 4.5 x 3 cm. Cast on 20 stiches and divide them between 4 needles. There will be 5 st on each needle then. We'll work in rounds starting with the 1x1 rib. then work only on first and second needles, which means - with 10 st. Take them to one needle and work in rows. Row 15 - 18: repeat row 13-14 two more times. Knit 4, k2tog on the 2nd needle, knit all the sts from the 3rd and 4th needles. In the next round k2tog in the beginning of the first needle and knit all the sts from 2nd, 3rd and 4th needle. So you get 5 st on each needle. Then you need to start decreasing to form the toes. K2tog in the beginning and the end of each needle. You will get 3st on each needle after making this row. Knit the next row with no decreases. In the next row knit together every 2 st. You will have 6 st left after making this row. Cut the yarn leaving 15cm long tail. Using the tapestry needle sew the last sts together and hide the yarn ends. This is a quick and fun project to make! Give it a try and in an evening you could make a couple of pairs for those little feet of your baby (nephew, grandchild, some friend's baby). It is so addictive that after the first pair it is really difficult to stop and you might find yourself choosing the colours for the next pair when the first pair is not even finished. 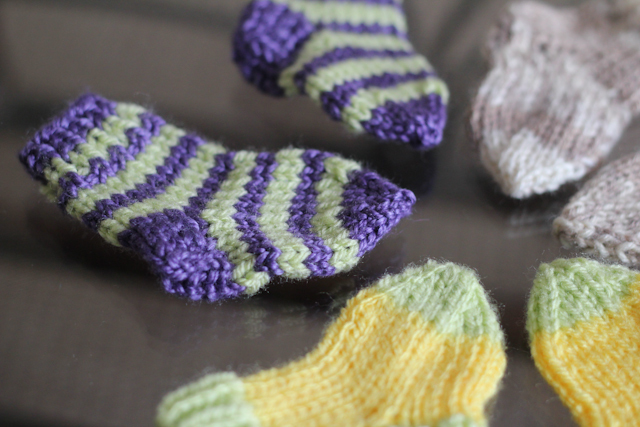 And if you make a pair I really would love to see the pictures of your little socks too! these are soooooo adorable and look soooo easy! I am knitting these little socks, pattern found on Ravelry. When you say (after knitting the heel) "Knit that 4 st from the top of the heel, then cast on 4st along the side of the heel" do you mean pick up four stitches on the side of the heel? Because if I just cast on four and then start knitting the stitches on the next needle, I have a big hole. How do I know when to change colors for stripes? Also, any answer on hole problem? This is my first time knitting socks, but I have crocheted socks before. Yes, you do need to pick up stitches on the sides of the heel. Make sure that the stitches are evenly spaced (which won't be that difficult, there aren't many stitches to choose from). The socks came out just fine. I really like this pattern. When I knit these socks I find if you pick up 4 stitches on the side of the heel, you won't have a hole. If you don't know how (I didn't) watch this video https://www.youtube.com/watch?v=QNf7jj3oyNs at the 16:20 mark she has just finished the heel flap. I found your pattern easy to follow and my finished tiny socks look nice and fit! I think when you say "cast on" the 4 stitches on either side of the heel, the more descriptive term is "pick up and knit". This is standard sock construction nomenclature and there are youtube videos that demonstrate how. Thank you very much for sharing this useful little pattern! Just finished making these little socks and they are adorable!! I am fairly new to sock knitting and need help with rows 20-24. Am I suppose to slip the first stitch? Thank you for the help. Yes you are right, you slip the first stitch. the temp in the house is +16??? Don't they have heat?? 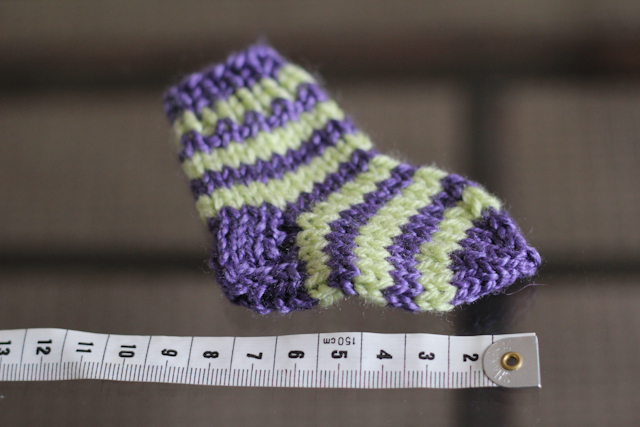 hi i was wondering if i can knit these tiny socks on 3 dpns as i only have a set of 4 dpns?